Alberti's Window: "Mask of Agamemnon": A Forgery and/or Misattribution? "Mask of Agamemnon": A Forgery and/or Misattribution? Not all scholars accept this idea that the mask is a forgery, but it is accepted that this is not the mask of the fabled king Agamemnon, even though Schliemann had imagined and wished such a thing. If Agamemnon was a real person, he would have lived about 300 years after this mask was made. Since only three burials were discovered in grave shaft V (and one of the burials had been presumably robbed, since it was devoid of goods), these two masks are the only ones by which we can compare Schliemann's statement. It doesn't take a genius to see that this second mask (NM 623) has a round face, whereas the other face could hardly be called "round." 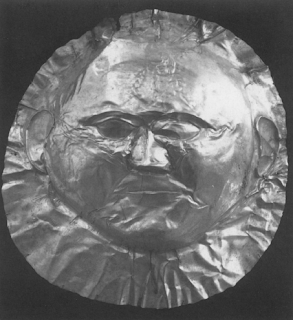 Could this be the mask that Schliemann originally identified as the "Mask of Agamemnon"? It certainly seems possible to me. 1 David A. Traill, Schliemann of Troy: Treasury and Deceit (New York: St. Martin's Press, 1995), 169-172. 3 See Oliver Dickinson, "The 'Face of Agamemnon,'" Hesperia 74, no. 3 (July - Sept. 2005): 299-308.